Little Flower Girls will just love these gorgeous accessories and gifts! One essential item for a flower girl is a basket. She will look just devine carrying a decorative basket down the aisle. Fill the flower girl baskets with rose petals to scatter along the way. A different option for flower girls (especially if your venue does not allow petals to be scattered) is to carry a sign or banner. We now stock these gorgeous two sided signs which are light and small enough to be carried easily. If you want a larger banner, we also sell some beautiful signs which are made to be carried by two children. Don't forget to also give your flowergirl a little thank you gift. Our keepsake board book is a wonderful way to capture the memories of their big role with photos, a message from the couple, signatures and places to record exciting moments from the wedding celebration. The book measures 18cm square. 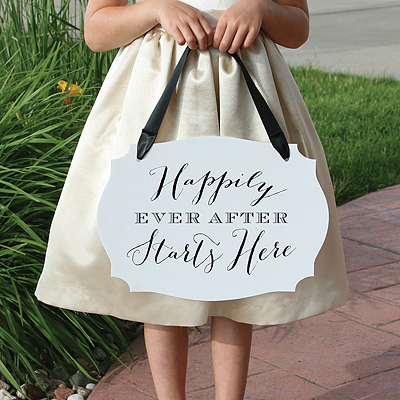 This keepsake will allow them to look back fondly on the magical experience of being a flower girl.